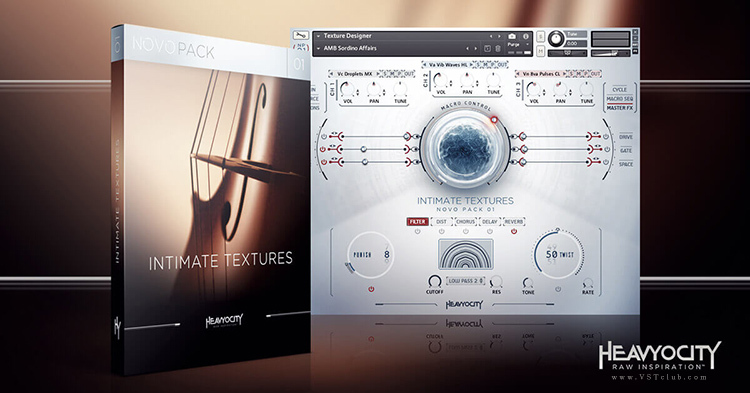 Combining the lush and textural beauty of violin, viola, and cello chamber string ensembles with Heavyocity’s signature hybrid sound design proficiency, Intimate Textures delivers a truly inspirational palette of cinematic VST orchestral instrument textures. Featuring creative extended techniques like vibrato waves and octave pulses, plus more traditional extended articulations like sul tasto and sul ponticello, Intimate Textures empowers composers to create unique orchestral landscapes in an entirely new way. Add in the award-winning NOVO engine, and the first NOVO Pack delivers an unparalleled package -- stunning orchestral VST source material, advanced processing capabilities, and a powerfully intuitive workflow. Recorded at the famous Reservoir Studios in NYC, Heavyocity's Intimate Textures features world-class players, performing in three and four person violin, viola, and cello ensembles. These advanced technique performances deliver a clean and lyrical sound, providing rich movement and texture with each note performed - perfect for scoring to film, games, and television. Composers will find Heavyocity's Intimate Textures to almost-immediately become an integral part of their template, with its ability to create production-ready composition elements quickly and easily. Creatively, the VST orchestral instruments available within Intimate Textures offer a deep well of inspiration - featuring a 14.2 GB (uncompressed) library, including over 5,000 samples and 192 snapshots. Heavyocity has spent nearly a decade building virtual instrument engines that inspire and enable creativity for the modern composer. And to that end, the award-winning NOVO engine is our greatest achievement so far. It starts with the MACRO CONTROL, the power to modulate and automate multiple parameters across each channel - including volume, pan, EQ, envelope, and various effects - MACRO is at the front and center of Intimate Textures' lush Texture Designer. And if you want to dive in deeper, Intimate Textures also includes NOVO's CYCLE feature - a new frontier for sound manipulation in a KONTAKT-based virtual instrument. Quickly create rhythmic pulses, swells, and granular-style pads with this cutting-edge dynamic playback engine. Explore an infinite world of sound design with Heavyocity's new NOVO Pack, Intimate Textures.